Today the stars must have been aligned because I had an all around awesome day. It was a nice contrast to yesterday because yesterday I felt like I was going to pull my hair out and I had all these weird issues creep up. Today, however, was a great day. 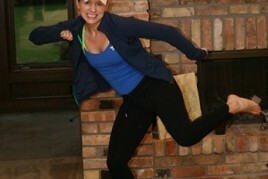 :) Lots of work accomplished, some successful recipe attempts, a great 4 mile run, and time spent with loved ones! Chewy, slightly crunchy, tangy, yet sweet and spicy. 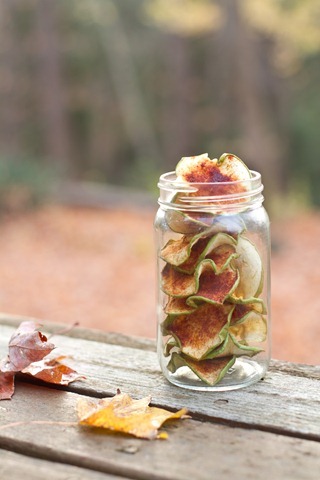 The perfect healthy Fall snack to throw in your lunch bag or give as a gift to loved ones. 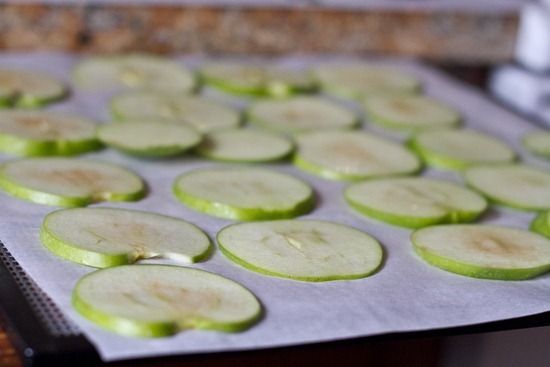 Directions: Line a baking sheet with parchment or line a dehydrator sheet with parchment. If using an oven and not a dehydrator, preheat oven to 150F. In a small bowl mix together the cinnamon and sugar. Set aside. 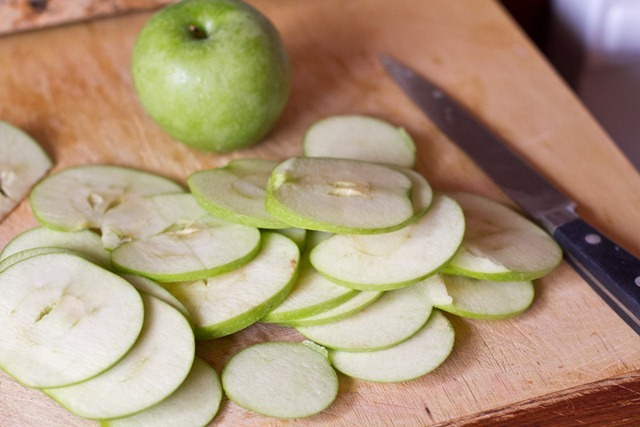 Slice granny smith apples into very thin slices approx 1/8-1/4 of an inch in width. Leave skin on. You may use a mandoline if you have one. 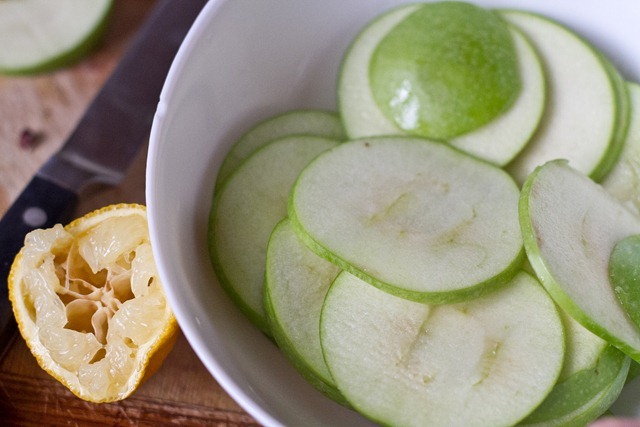 One apples are sliced place them into a medium sized bowl and squeeze fresh lemon juice over top. Line up the slices on the baking sheet, making sure they do not overlap. 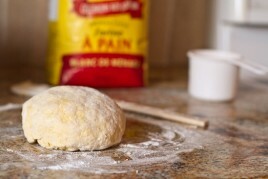 Grab the sugar mixture and sprinkle over top of each slice. 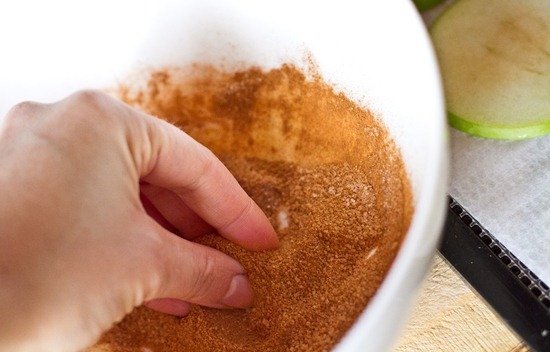 Now take a tiny pinch of sea salt and sprinkle very lightly over top. You may skip this step but I like a bit of salt to bring out the sweetness of the apple, however it might not be for everyone. Place into the oven or dehydrator at 150F. 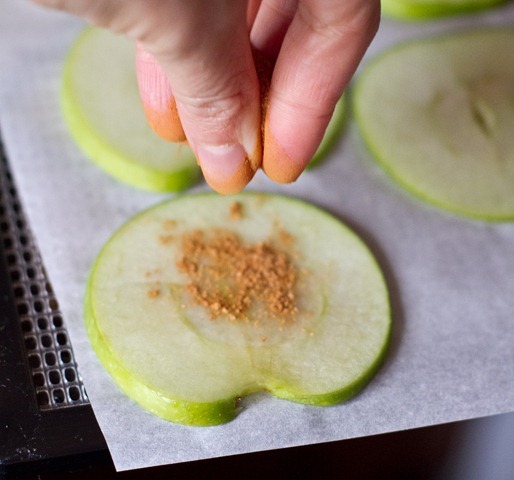 I dried the apples in a dehydrator at 150F for approximately 3.5-4 hours. Flip the apple slices every half hour to ensure even cooking. I am not sure how long an oven would take, but you can play around with it, checking them often when you flip them every half hour. They are ready when they are curled up a bit at the sides and a bit crisp yet still chewy. You can cook them to suit your needs! These chips were quite easy to make! Spread it around with your fingers a bit. And place in oven or dehydrator, flipping every 30 minutes. After about 3.5-4 hours in my dehydrator at 150F. You can also bake them in the oven too! If you are feeling really crazy, you can try brushing some melted Earth Balance or butter on top before sprinkling on the sugar & cinnamon. I bet that would taste great! Wouldn’t these Apple Pie Chips make a fun gift? I cannot contain my excitement. The 80 year old grandma in me is waiting to bust out!! I’m off to snuggle up with Sketchie & Eric and watch some NCIS. I would take those over potato chips every time. TIP: You can also string them and hang them in a cool dry place if you don’t have a dehydrator. great job – they look so tasty! I used to buy something similar at the store–love! Now I just need a dehydrator…or I need my dad to go on a business trip so I can use the oven for 309243 years :) I love how curly they got! I’ve got to try these! 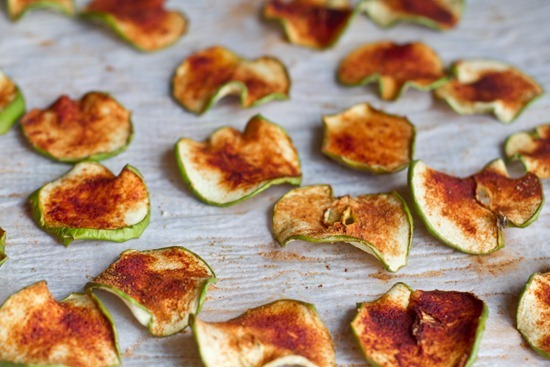 I love apple chips and would love to make my own with local apples. these look lovely. what kind of sugar are you using? palm? wow – you are right – these would make a WONDERFUL gift! Wow- yum! 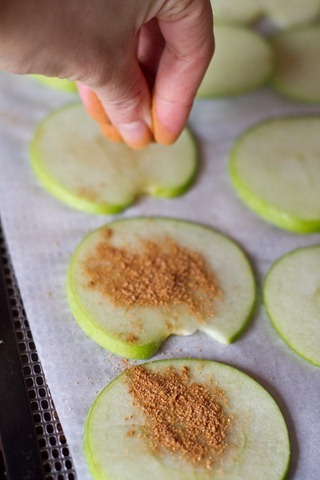 Been wanting to make apple chips. Yum! Those look so delicious, perfect fall treat. Those both look and sound delicious! I’m an apple fanatic, so those are right up my alley. I would rather munch on a bowl of apple chips than potato chips! Thanks for the recipe. I’ve been wanting to experiment with my new food dehydrator, so these will go onto my list. I was going to make some plain ones, but maybe I’ll make a second batch with sugar and cinnamon. Mmm. Oh my gosh! Those look so amazing! I wish I had a dehydrator but ill definitely try them in the oven. I love finding new apple recipes! How do you think these would work with red apples, like johnathan apples? These look so amazing! I think the lowest my oven goes is 200 degrees. I hope that will work, haha. That last picture is SO pretty! Oooh, I like! And what a beautiful picture of the sky at the beginning! Glad you had a great day! Any idea how long this would take to make them in the oven? Oh my. Oh my my my!! This recipe knocked my socks off! I must make these asap! The apple chips are very pretty Angela!!!! They would be a fabulous hostess gift! Those are some of the most beautiful looking apple chips I have seen! Most of the time they are all crumbly lookin’ but these are just perrrrrrfection! 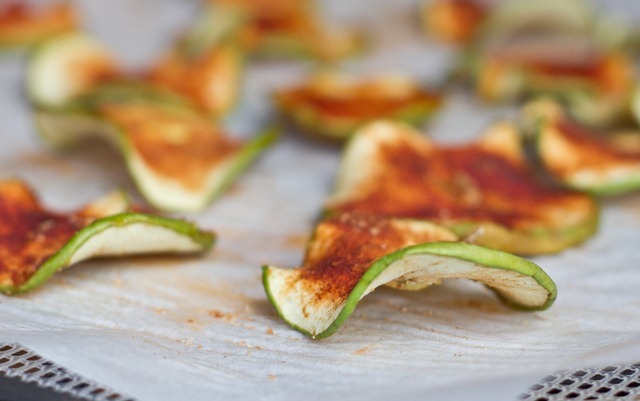 I love dehydrating apples with cinny & brown sugar, or zucchini’s with nooch, for apple or zuke chips but honestly my fave thing…is banana chips. I make my banana chips like you made the apples, with cinnamon & I use brown sugar…or just leave them plain. ACtually plain dehyd’ed bananas are so awesome to me and I am not even that huge of a banana lover. But dehyd them…and Im in heaven. Btw I think I just noticed your button/banner on the right hand side of your site..by sponsors. Your GloBakery button. Not sure if it’s new or not, but I just noticed it :) Cute! If you’re baking them, how long should they be in the oven for? What a perfect fall snack! I will have to try making these soon. Would they work with other types of apples too? Beautiful photography by the way! I’m sure they would! In the original recipe it said any type of apples. I likes grannies b/c they are tart and it is a wonderful contrast to the sweet cinnamon sugar. Yes! what a great snack that I can make-no problem. Great idea Angela. 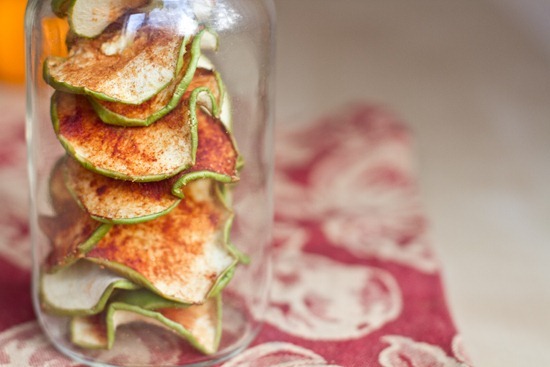 I love apple chips, I wanted to make these myself too but somehow, I’m too scared beacause I think they will burn! :P You can buy them in the grocery store but it’s much more fun making them yourself! I loooove dehydrated apple chips. They’re one of my favorite things to make. You should try dehydrating kiwi slices, too! These look amazing! Thanks for sharing Angela. 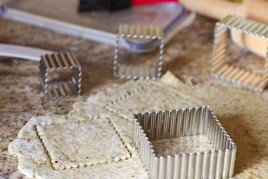 I made similar for festive presents last year with stevia as the sweetener and kept them raw by using a dehydrator. Started reading your blog a few days back. Love it! These look delicious. Can’t wait to try them! 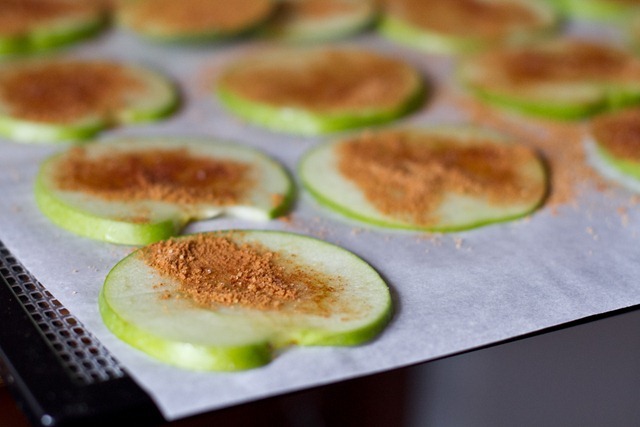 I’ve been dehydrating apples like mad (’tis the season) and using cinnamon. Didn’t even think to add sugar because they are so naturally sweet. You didn’t find them too sweet? Might have to consider a little sugar, too! I always forget how simple those are to make and how delicious they are too. Great idea! I am always looking for something crunchy to snack on! how long od you think these would keep in an airtight container? i recently tried my hand at making apple chips but i using the stove…..they turned out horrid! blech. yours look much betta! :) have a great friday. I wish I had the patience for something like that! Yummy! Ha! I love your 80 year old grandma comment! There are plenty of days where I feel exactly the same! i’ve been wanting to make these for a while now, i think it’s time i do! you just kind of made my heart SUPER happy with this! i love apple chips but have never made my own…it’s so easy though! Looks yummy! I need a dehydrator. Love this, Angela! My boyfriend will be happy for me to turn the ol’ Excalibur on again! I love buying dried apple rings from the bulk section, but if I’ve learned anything, it’s that homemade is almost always better! These look awesome. My gramma gave me her old food dehydrator a while ago (“Because you don’t, you know, eat regular food,” she said — XD) and this sounds like a great recipe to break it in with!!! These would be perfect to bring to work when I need my afternoon fix (like right now). 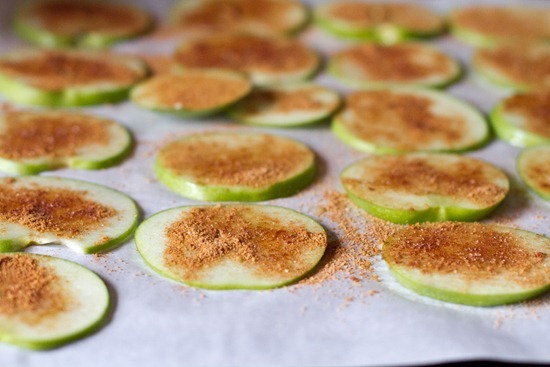 I’m going to try them tomorrow in the oven with some unidentified red apples from the farmer’s market – probably reducing the sugar a bit since they are sweeter than the granny. Thanks! yum!!!!! i have trouble eating apples because of the acid they contain but i find whenever i bake them my tummy is usually happy. 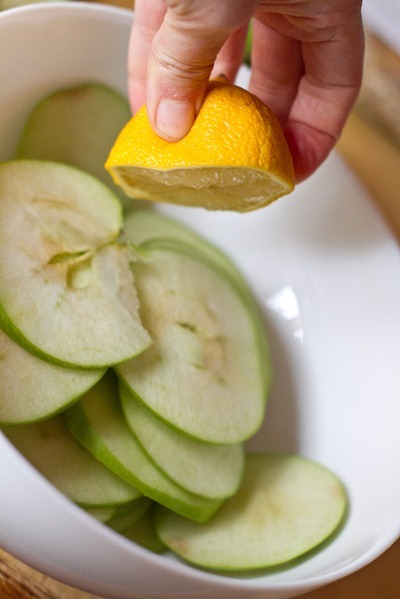 i’ll try this one out soon as i get some apples in my hands :)! Wow, these look great! Just the thing for my 3-yr old…I’ll bet she would love ’em! Those look so good! I’ve been wanting a dehydrator for a while… Might need to add that to my Hannukah list. What kind do you have? those look amazing, I never would ahve thought to make anything like that! 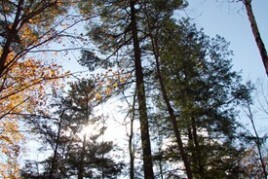 I’ve been reading your blog for a while now, and I find it (and you!) really inspiring. Also, congratulations on advancing to round six of the food blogging challenge! Oh my! Those look amazing. 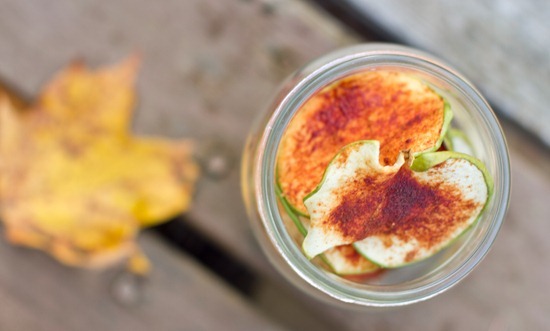 We just went to the orchard last week so I’ve been trying to come up with apple recipes…this one looks fantastic! great snack idea!! they look yummy. i am debating on getting a dehydrator!? can anyone recommend a good one? I can’t wait to try these. A little time consuming, but they look worth it! Ohh these sound awesome!! I;ve never had apple chips, just dried apples. I don’t really care for them, but I’m sure these are much, much better. Oh these are so beautiful! 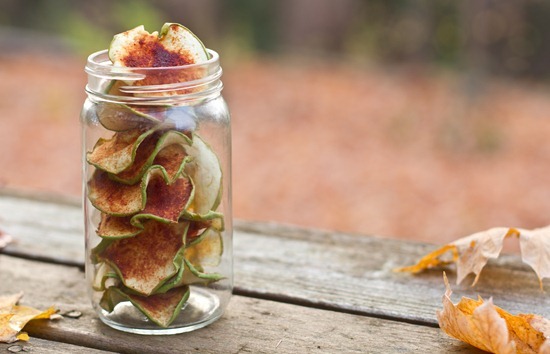 I’m obsessed with dehydrated apples. I can eat them non-stop! I’m always surprised by how tasty they are too, even though I know that they’ll be good when I make them. These look wonderful, Angela! Thanks a bunch for the recipe. Oh MY GOSSSSHHH. My new mandoline slicer and I thank you. Very much. WOW. Mmmm! These chips look awesome. Autumn in Canada must be so gorgeous. 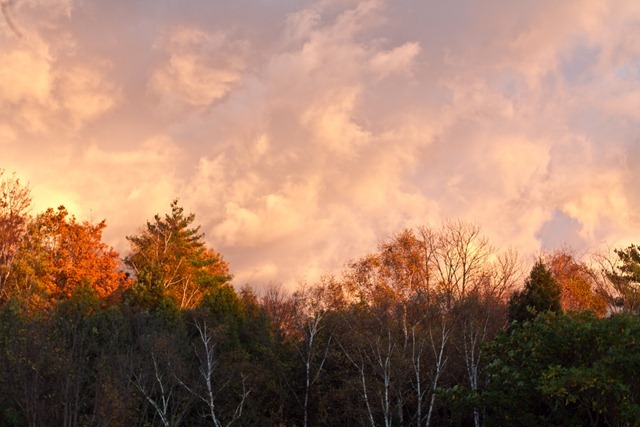 At least everything you have shared this season has looked like the quintessential snapshots of fall. I have a nu-wave oven which can be used as a dehydrator. 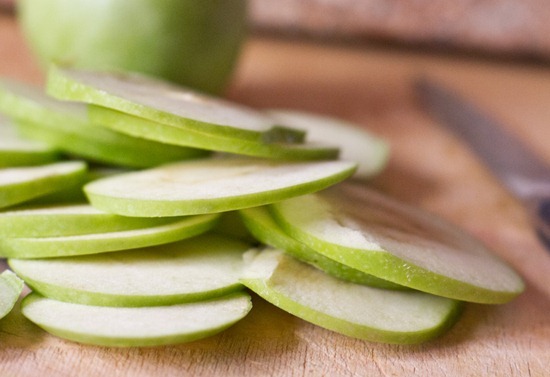 Unfortunately, the pan only has room for 1 sliced apple, but it’s worth a try! I read that you put the temp to 20% of the total maximum heating capacity. My chips are cooking as we speak (and the leftover slices that didn’t make it on the pan have now been devoured my yours truly). Oh, I also tried using Splenda Baking Sugar just to cut down on the calories… Thanks for a great idea! Looks yummy and great photos! These look absolutely amazing, I want to make them tomorrow! These sound GREAT, thanks for sharing! I just made these and they rock! I baked them in the oven at 175 (the lowest my oven would go) for 3 hours. Crispy and slightly chewy – delish! Can’t wait to try these! Do you know how long they keep for? I’m wondering if I doubled or tripled the batch, how long they would stay fresh? Let me know. Thanks a bunch for posting this. Hey Im not too sure to be honest – my batch was consumed quickly :) Just to clarify – these are very soft, not crispy like chips.